Bulgarian MPs were able to make their way out of Parliament at the end of the session on November 12 after police forced a clear path for MPs’ cars despite attempts by anti-government protesters to organise a sit-in. 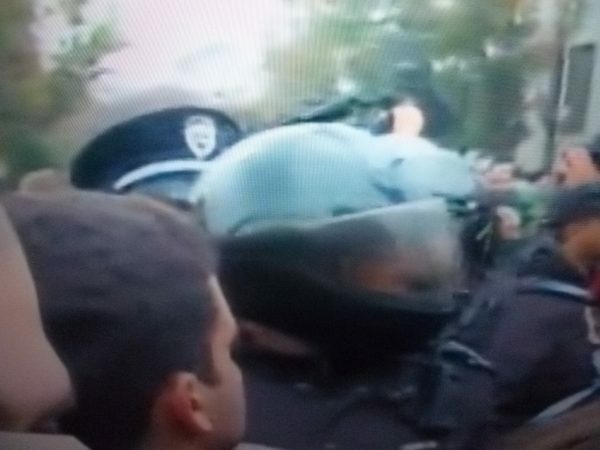 Some reports in Bulgarian media claimed that police officers – not wearing any identification, despite being required to so by law – used excessive force in clearing the way for the cars. The reports also said that at least five people have been detained by police for refusing to obey police orders and sitting in the street. It was not immediately clear whether this number included a professor from Sofia University, detained alongside two of her students for refusing to make way. At least one person was injured earlier in the day as police and anti-government protesters got into shoving matches outside Alexander Nevski cathedral as protesters attempted to use human chains to prevent MPs cars leaving the National Assembly. A man was seen being treated in an ambulance outside the cathedral, being treated for a cut to his face. The November 12 incident followed a symbolic blockade of the National Assembly by several hundred anti-government protesters, many of them university students, as inside a successor was elected for former deputy speaker Hristo Biserov, who quit Parliament shortly before it emerged that he was being investigated in connection with allleged money laundering and tax evasion. After the vote, protesters attempted to form a human chain to block the paths of the vehicles of members of Parliament. 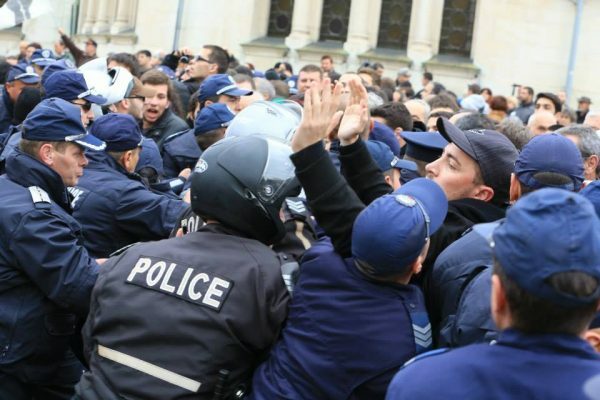 In turn, police, some wearing motorcycle crash helmets and masks, clashed with protesters, resulting in a form of loose scrum near the cathedral. A protester who reportedly tried to obstruct the passage of a police vehicle was said to have been arrested. In the first stage of the clashes, some protesters were knocked to the ground and had their clothing torn. Police briefly detained some participants to record their identity documents. Earlier, some of the group threw tomatoes and eggs at the building of the National Assembly, reiterating their demands for the resignation of the Bulgarian Socialist Party government, fresh elections and profound political reforms.